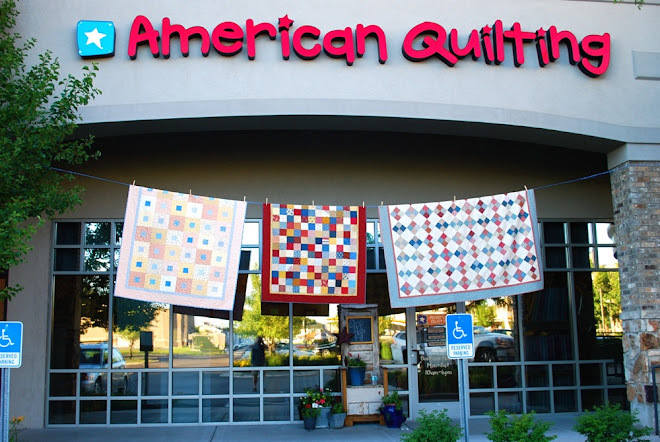 AmericanQuilting: Big sales at American Quilting! This weekend is the Holiday Shop Hop in northern Utah. While we are not officially part of the shop hop this year, we are offering lots of specials and sales in our store through Saturday, October 16. We have a lot of new yardage in our clearance room as well. A few of our quilt kits that are on sale 40% off! This throw sized quilt (62"x77") is made from the Aviary collection by Three Sisters for Moda. It is a simple quilt of squares on point. The pre-cut squares and triangles are laid out in labeled rows so all you need to do is pick up and start sewing. Includes pre-cut borders and binding as well. Regularly $70. This little baby sized quilt (42"x51") is called Mary's Flowers with all prints coming from Mary Englebright's Flower Basket collection. Kit regularly priced $50. Includes borders and binding. This quilt is called Spiced Cake and made-up with prints from Lakehouse fabrics. The quilt is a large throw, roughly 70" x 80". The kit is regularly priced $80. If you're local, come by and say Hello! If you're not going to be in northern Utah this weekend, and you are interested in any of the sale kits, call us at 801-802-7841.